Theatre Morin Heights, like any community theatre, is only as strong as its supporters. There are many ways to support us but the most important is to BECOME A MEMBER! 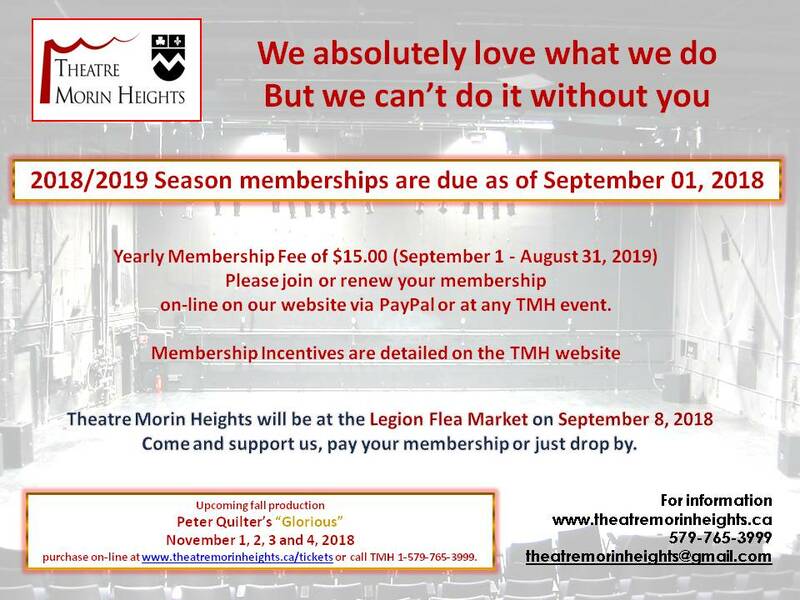 Our members are the lifeblood of our organization and their passion for a theatrical life is what makes Theatre Morin Heights exciting and creative. Your $15.00 membership is important to us! TMH is a non-profit organization. Your membership fee enables us to bring quality live English theatre to the Community. As a member you will be given the opportunity for advanced ticket purchase. Last year’s performance “I’ll be back before Midnight” was sold out during all 4 performances. Advanced ticket purchase will be available for members only between September 8th through the 13th, 2018. You can purchase either on-line at www.theatremorinheights.ca or by calling TMH directly at 1-529-765-3999. As a member your name will be entered into a draw for a Health & Wellness Beauty Gift Basket valued at $200.00. Draw to take place after the last performance of “Glorious” on November 4th! As a non-profit, volunteer, community organization, Theatre Morin Heights is dependent on the invaluable time and efforts of its membership in continuing to be successful. All members are encouraged to fully participate towards the organization’s goal of providing quality theatre experiences to our audience. Theatre is a collaborative art that requires all levels of skill, experience and talent. Thriving on volunteers that do everything from designing sets to tending bar is how Theatre Morin Heights encourages the community to get involved and to understand and appreciate the making of theatre. If you would like to become a member, please complete our Membership Application and Form . Once completed, please scan it and email it to us at theatremorinheights@gmail.com and select the ‘Join’ button below to pay your $15.00* membership fee on-line. You can also print the form and mail it along with your $15.00 cheque. Memberships can be renewed by selecting the ‘Renewal’ button below. We already have all your information so nothing else is required to complete your renewal. Please let us know if your contact information has changed in the past year. *NOTE: An extra $0.76 will be added to each membership purchased online to cover fees.